Door-to-door shipments that are economical, efficient, and provided with the utmost customer care. Canaan Group continues to be a leader in the freight forwarding market for ocean freight. Last year we shipped more than 100,000 containers worldwide. Lined up back to back, they would stretch from Vancouver to California. With this global volume, we are to provide competitive pricing that individual companies cannot obtain with the shipping lines directly. We offer full service, door-to-door delivery of your goods to and from anywhere in the world. Our experienced ocean freight team offer excellent customer service to you when it comes to quotes, bookings, cargo pickup, documentation preparation, container loading, shipment updates, and customs clearance. We are a full service provider, capable of managing various types of shipments. For most companies, LCL shipments are too small for them to handle. At Canaan Group, we value our customers moving small volume. We have weekly containers that depart Canada to over 150 destinations. Not only do we optimize each leg of your shipment, we provide you full visibility at every point of your cargo’s journey. At Canaan Group, we are one of the top 10 privately held companies in Canada who work with the top 5 shipping lines in the world. With these global partner carriers, we always have access to competitive rates, preferred spacing, and available equipment. Aside from traditional product offerings, we also have digitized contracts that guarantee 100% fulfillment. Shipping both import and export boxes, we optimize your containers for match backs, and provide full visibility and tracking. With 40 years of maritime experience, we can charter liner vessels whether they are Panamax or Post-Panamax vessels. This allow us to provide a variety of options for your cargo aside from traditional products that fit into containers, Canaan can arrange for these products to be shipped on Breakbulk vessels. Since Canada is a country rich in natural resources, Canaan has been exporting many bulk products including agriculture, mining, forestry, and other large volume bulk commodities via bulk carriers all over the world. We consider large bulk carrier vessels shipping one of our specialties. 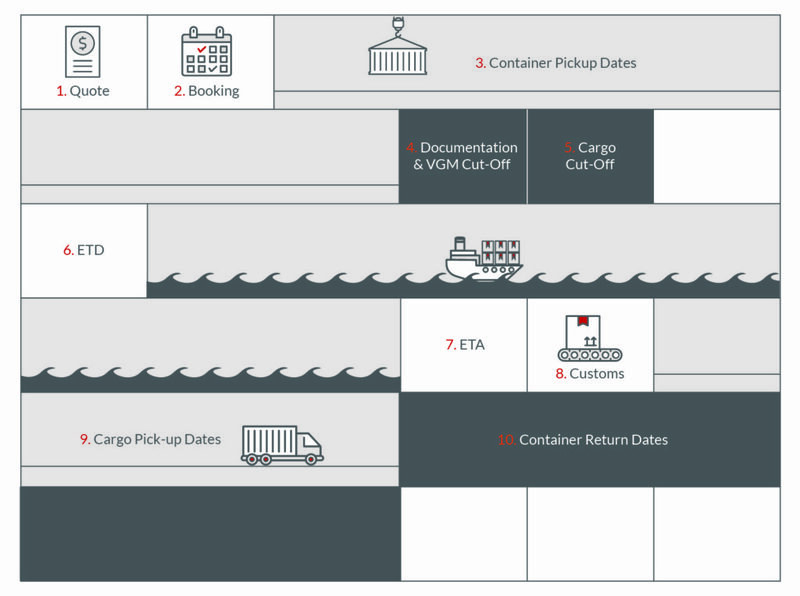 Here's a visual representation of the dates to remember for ocean freight. Please refer to your booking confirmation for the exact dates and times.